Fr. Baker reflects on the power of the Resurrection. Take a photo tour of St. Joseph's Oratory in Montreal. Learn about the history of the Congregation of Holy Cross. 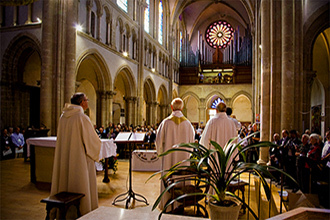 France is the birthplace of the Congregation of Holy Cross. Within three years of his founding of Holy Cross in 1837, Blessed Basile Moreau was sending missionaries not just around the French countryside, but around the world. Today the Congregation continues to work in schools and parishes in France. Holy Cross also welcomes pilgrims to its conventual church, Notre Dame de Sainte Croix, which was built by Moreau and now serves as the International Shrine dedicated to his spiritual legacy. Author: Fr. Robert Baker, C.S.C. Fr. Roberto Baker, C.S.C, reflects from Peru about how the Resurrected Christ invites us to share in his life and be transformed. Fr. Prasanta Basumatary, C.S.C., is the first of three priests to be ordained for the Province of North East India during 2019. Br. John Badu Afum, C.S.C., reflects on how the silent witness of St. Joseph can help us to hear the Will of God today. 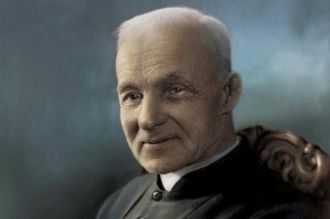 Brother André Bessette, C.S.C., is the first canonized saint of the Congregation of Holy Cross. He was known as the "Miracle Man of Montreal" for all the people who were miraculously healed through his intercession and prayers. Br. Paul Bednarczyk, C.S.C., Vicar and First General Assistant of the Congregation, reflects on how this humble brother who welcomed the sick and suffering with God's love and mercy can guide us to our Savior, Jesus Christ.